Beta Cavi manufactures and sells a variety of series of cables, for different uses and applications, in the most popular segments of the market. In Beta Cavi employs a team of research and development, thanks to the collaboration with leading equipment manufacturers, is able to provide to its customers with innovative solutions and characterized by a strong technological innovation. Engaged for years in the technical committees for the drafting of standards, helps in the dissemination of technical knowledge through educational seminars, in partnership with major international players of equipment, which are held at the premises of the respective professional associations. The added value that Beta Cavi guarantees, is the continuing assistance in choosing the right product to be installed at designers, to installers and its customers. Coaxial cables developed to obtain the best result from an HD video surveillance installation. The HD Coax Cables series is composed by three types in single version (only coax) or three types in hybrid version (coax + power). In this way we can solve all the installations problems due to the higher cost transmission of the signal on fiber or UTP cable and them active components. The coaxial cable, often seen as a secondary completion of the video surveillance, which is not recognized great importance, is the communication line on which the video signal passes … and inevitably degrades. The signal quality and reliability of the connection are represented by more elements, but only in the design and scope of development is possible to limit the problems remaining focused on the application. To overcome the problems associated with the cable into the digital and analog transmission (not clear images, fog, loss of detail, shadows on the edges, etc. ), it was necessary to develop a new cable that would take into account the technological evolution. 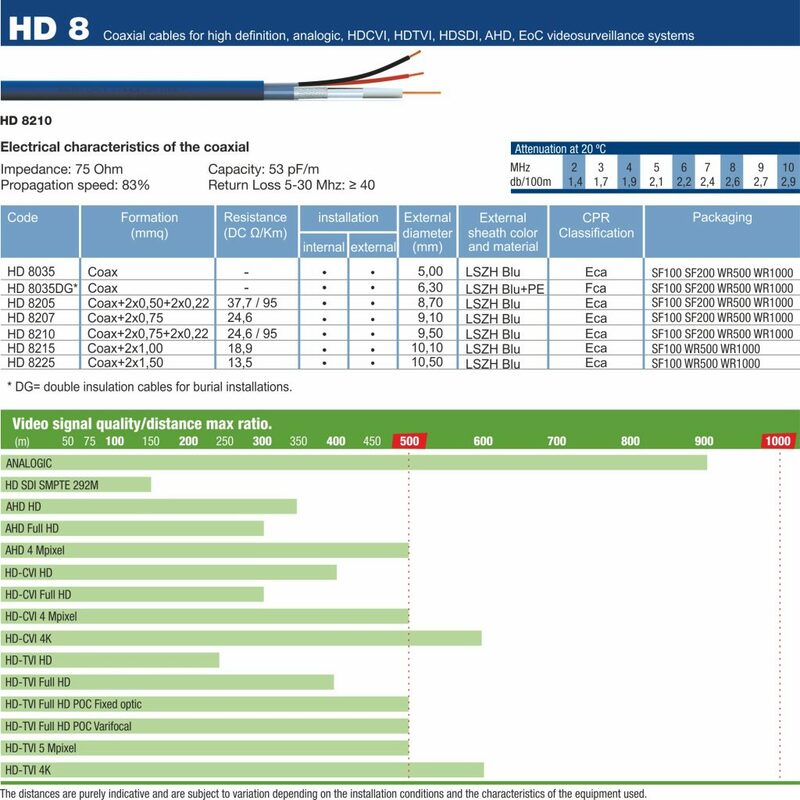 The HD Beta Cavi coaxial cables series has been designed considering the system as a whole, to avoid that the same cable represents the real limit of a video surveillance system. During the design we have placed special emphasis on the technical characteristics of the video signal (compressed or not) and protocols, ensuring excellent transmission and video signal while maintaining the performance of the equipment used also over distances considered unattainable until recently. The development of new analog video surveillance technologies that can deliver HD (1280 x 720), Full HD (1920 x 1080) and Ultra HD – or 4K – (4096 × 2304 16: 9 or 4096 × 3072 in 4: 3), demands the use of cabling of better performance and reliability, that can withstand these resolutions in the long term. To maximize equipment performance from a performance standpoint, it is essential to use coaxial or hybrid cables, with connectors specifically designed to optimize video data flow, protecting the signal against external, electromagnetic and environmental influences. Cabling is a determining factor so that the information is transmitted with fidelity, to the point of being seen as an extension of the apparatus itself. 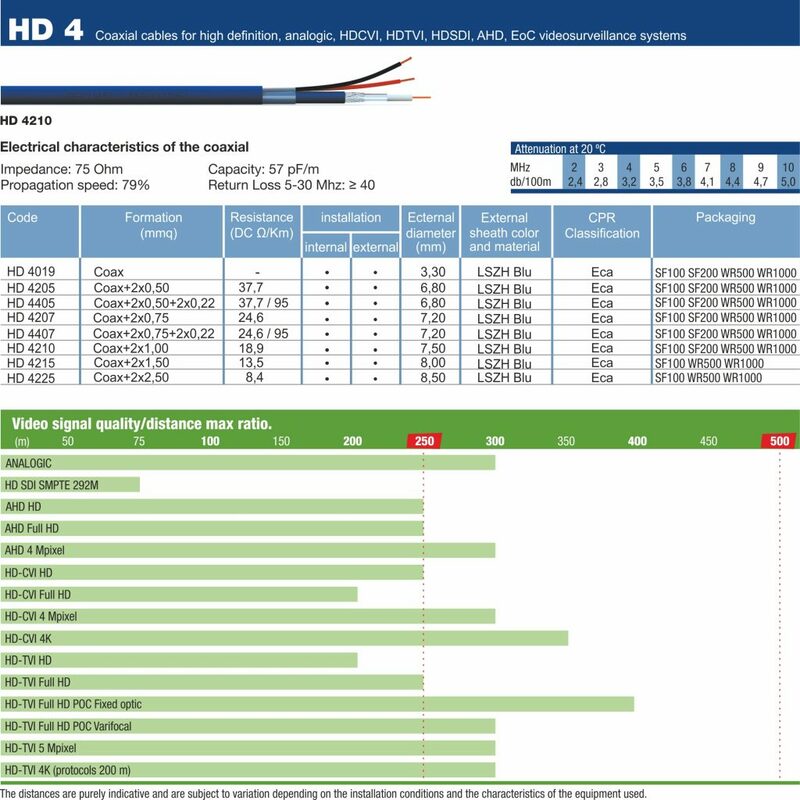 In order to direct the installer to the right choice by offering the cable that best suits your needs, the HD series cables – considered internationally as a market benchmark – have been tested with all the HD technologies available in today’s market . – The junction point or connection is responsible for about 80% of the defects of a system. The entry of moisture or water at the junction points causes deterioration of the video signal, which can lead to its complete interruption. 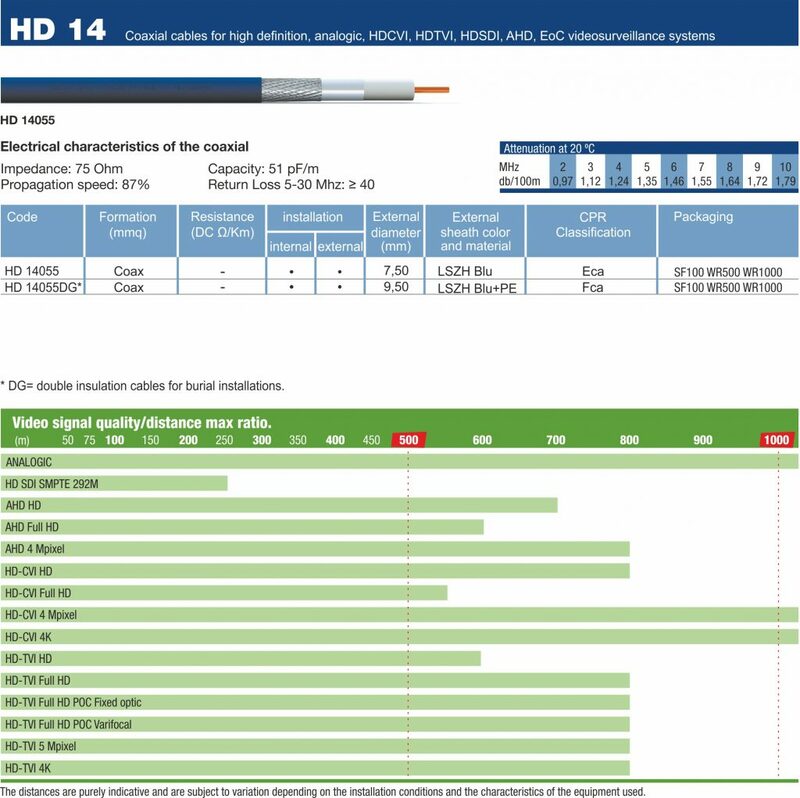 – Conventional connectorization with crimp or solder connectors can seriously compromise the quality of the transmitted video signal. – Special attention should be given to the power supply line, to avoid the introduction of noise (harmonics) from the same power supply. – The cost of the infrastructure (piping, masonry, etc.) is independent of the quality of the cable that will be used. Studies show that the use of a higher quality cable is a decisive factor for the proper functioning of the system and its cost influences in an insignificant way the overall cost of the work.